Our Point of Sale Systems (POS Systems) provide your business with the technology to keep inventory, track sales and generate purchase orders, all in one place. If you've been working with pen and paper or even with an electronic cash register, you will be surprised at the amount of time and money a POS system can save you. A complete retail system minimizes human error and automates sales to provide you with fast, efficient check out that will benefit both you and your customers. Features, The Retail POS System is a great way to speed up the checkout process without draining your bank account. 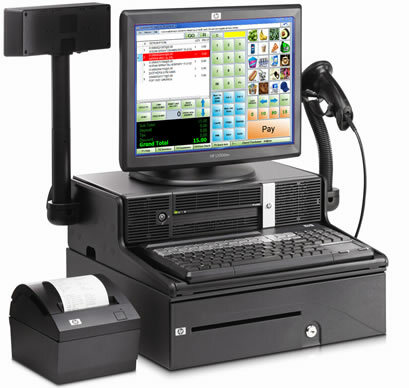 With the system, you get everything you need, including barcode scanner, receipt printer, base computer, monitor and POS Software. Ideal for basic sales and customer tracking, the included POS software provides an easy to use system, saving you time and money. Each system is preconfigured to work straight out of the box, all you have to do is plug in the peripherals.